The Taco Truck- This New Jersey-based company has given Boston's Mexican food scene a new spin this summer with their "unique fast-casual authentic Mexican taqueria concept". Serving up some of the freshest, most delicious and unique tacos around, any fans of Mexican food should definitely check them out. We suggest their Pescado taco, made with crispy catfish and topped off with a Mexican tartar sauce, pico, and red cabbage. 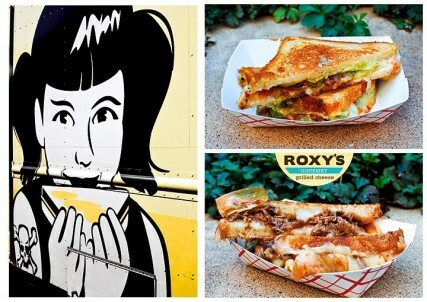 Roxy's Grilled Cheese- Since it's opening in March 2011 by Emerson College graduate James DiSabatino, Roxy's has some of the best grilled cheese sandwiches out there. We're not the only ones who think so, they made it to the final three competitors on the second season of Food Network's The Great Food Truck Race. Bon Me- This Vietnamese-inspired food truck sits outside the Pru near the Christian Science Center. For just $6, satisfy your tummy with a choice of either a rice bowl, noodle salad and of course, a Vietnamese sandwich. Momogoose- Specializing in "gourmet, healthy Southeast Asian cuisine", they offer a variety of Vegan, vegetarian, and non-vegetarian options with flavors from Korea, Vietnam and Japan. Clover Food Lab- Clover Food Lab offers possibly one of the best vegetarian sandwiches in all of Boston, Try their delicious Chickpea Fritter Sandwich. Served in a whole wheat pita and stuffed full with homemade hummus, Israeli salad, sliced pickles, homemade chickpea fritters, pickled vegetables and topped off with tahini mixed with lemon juice, it's quite possibly one of the most delectable vegetarian sandwiches in all of Boston. Lobsta Love- With a menu resembling that of a traditional seafood shack you might find beachside at Cape Cod, this food truck will hit the spot for any seafood lover. Feigning for seafood but not hungry enough for a whole meal? Try a "shot" of their clam chowder or lobster bisque to satisfy your craving.